Chevrolet and Microsoft have signed a deal to use Kinect, the soon-to-be-released motion control system for the Xbox 360, to promote the Volt, the soon-to-be-released electric car. When you want to sell a pickup truck, you license a cheesy Bob Seger song and overlay it with images of rugged, burly men in cowboy hats and construction helmets dragging ridiculously large loads of random crap up horrifyingly steep inclines at dangerously unsafe speeds. But what do you do when you want to sell a snub-nosed four-door that plugs into a wall? You call Microsoft. Chevy will be running conventional online ads for the Volt over the internet and Xbox Live, but the car maker has also teamed up with Microsoft to include it as an unlockable vehicle in Kinect Joy Ride, a motion-controller driving game. Kinect will also be used in a series of Volt promotional events and showroom tours across the U.S.
"[The Volt is] One of the most exciting developments the automotive industry has seen in years. 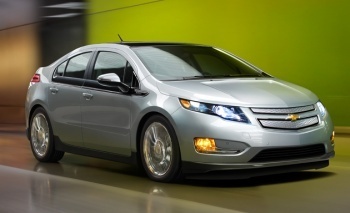 Our marketing campaign needs to reflect this," said Chevrolet Marketing's U.S. VP Jim Campbell. "Kinect allows us to bring the excitement of the showroom to the living rooms of our customers. It's a way for us to replicate the experience of physically engaging with a product that is essential to the customer's purchasing decision." The cynic in me is anxious to make a snide remark but the truth is that product placement in entertainment media is hardly a new phenomenon and this isn't the first time videogames have been used to sell cars, either: Ford had an entire series of racing games dedicated to it that ran for almost a decade. Microsoft, meanwhile, was dabbling with licensed unlockable vehicles all the way back in 2000 with Midtown Madness. Kinect and the Volt may be new, but videogames and cars? Not so much.